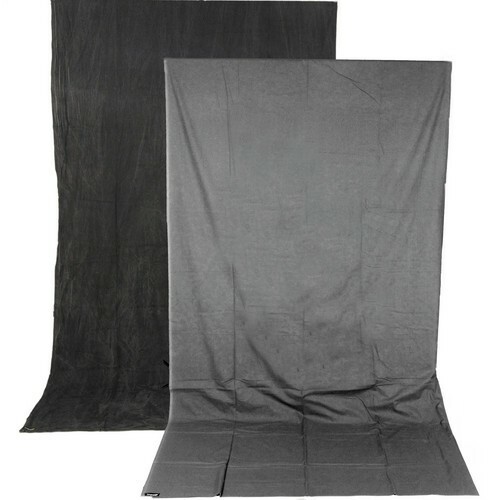 The 10 x 12' charcoal/smoke gray Reversible Crushed Muslin Background from Impact is made from a high-quality 100% cotton material. Suitable for video or still photography, the fabric is one-piece so there's never a concern of a seam showing in the shot. The two-sided color scheme makes this background even more useful than traditional single toned backdrops since it saves you the cost of having to buy two separate backgrounds. Gives every photo a professional touch. Had to steam out the wrinkles when it first arrived but no complaints since then. The two sides are not exactly the same shade of gray so it is reversible but both sides are in the darker side of the spectrum. I would recomend this to a friend.